A perfectly manicured coiffure has its time and place, but there’s something deliciously satisfying about a messy head o’ hair. Perhaps it’s the carefree vibe it gives off, or maybe it has something to do with all those strands of hair that seem to harmoniously complement one another with seemingly minimal effort. Whatever it is, I dig it. Below you’ll find five messy hairstyles that are one part chic and one part tousled. May you go forth and recreate them (and then earn yourself lots of compliments). Here’s a quick, tousled hairstyle that’s perfect for summer. All that’s required for this look — which comes to you from the Treasures and Travels Blog — is a large elastic headband and a few minutes of your time. Start by placing the headband around your head, then twist the front portion of hair (including bangs) around the headband. Spray a little sea salt water on the rest of your locks and then go about your day. Don’t worry, shorties, I’ve got you covered. This messy curl look is brought to you by Amanda at the Indie Jane Photography blog. For this hairstyle, Amanda uses a flat iron to curl her entire head of hair in 1-inch sections at a time. After allowing the curls to cool, flip your head over and apply your favorite volumizing powder to the roots. Next, lightly coat with a flexible hold hair spray, scrunch and style as desired. This bohemian inspired messy braid, found on the befittingly named “A Beautiful Mess” blog, is perfectly lovely for midday shenanigans. To recreate, collect hair on one side of your head (or French braid it over to one side) and then tease like it’s your full time job. 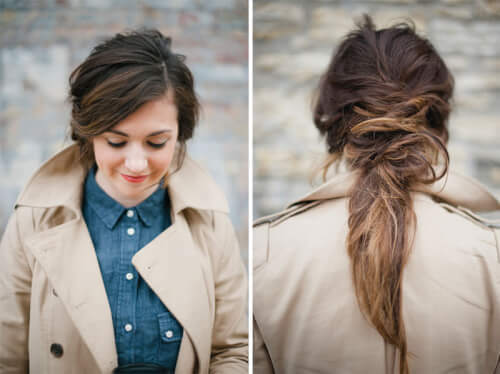 Braid into a standard braid, then pull the braid apart so it’s uneven and loose. 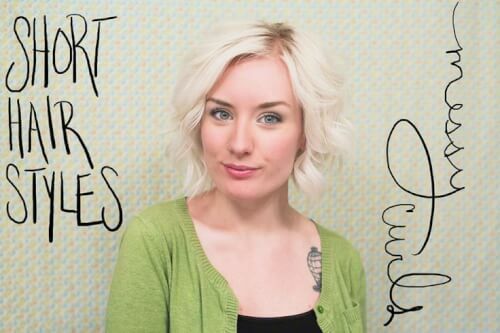 The full tutorial is on the blog, so check it out for helpful tips! “Achieving the perfectly tousled ponytail has long eluded me,” laments Kate of the Wit & Delight Blog. “It seems like a simple trick, but I’ve found many women have similar woes. Too high, too tight, not enough lift…” It seems like she’s figured it out, though, and shares the how-to with her readers. Note: there’s lots of teasing required for this one, but as you can see, the end result is simply smashing! YouTube User Lily Melrose knows how to “perfect” those enviable bed head waves, and it’s a look far easier to achieve than you’d think. First, use a professional grade flat iron (she uses about a 2-inch plate) and slowly rock it back and forth to create dents in your hair. You’ll see what I mean in the video. Once you’ve done this to all your hair, use a texturizing spray on the ends to amp up the muss factor and then use a hair spray to help set the look. She also uses a root powder for some lift around the temples. Like these disheveled, messy hairstyles? 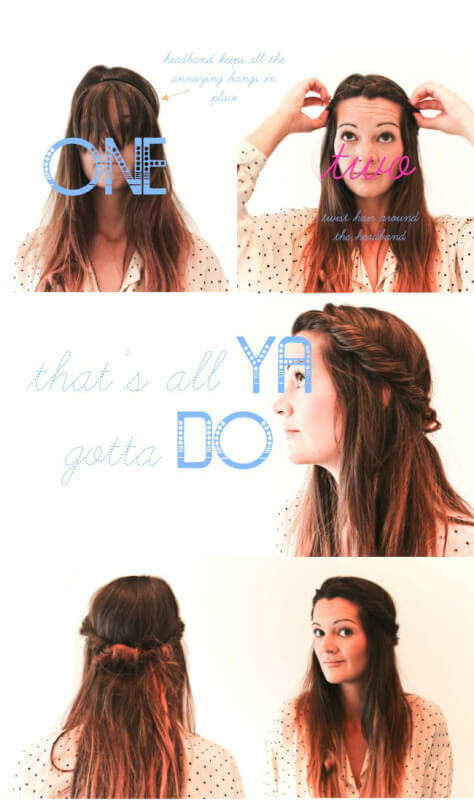 Then you’ll love the 5 “messy buns” we covered in this roundup!